Waimate's Dylan Kennett hopes to upgrade a bronze medal to a rainbow jersey at next year's junior world track cycling championships in Invercargill. The 16-year-old – the standout rider at this week's ILT junior track carnival in Invercargill – was third in the six-event omnium at this year's world championships in Moscow. While he wasn't surprised to win a medal, he was pleased at the nature of his performance, winning three of the events and coming second in another. That type of showing will mark him as one of the riders to watch when Invercargill plays host to the world's best young track riders in August. "I just need to improve my bunch racing and, hopefully, I'll get some of those world champion's [rainbow] stripes." 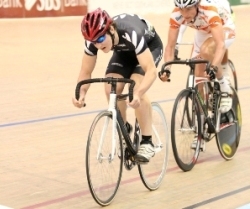 Kennett had watched New Zealand representatives Marc Ryan and Shane Archbold racing at his local velodrome in Waimate for several years before his father bought him a bike and suggested he have a go at the sport. Four months after taking to the track, he managed a top-five placing at his first national championships. Twelve months later he won five titles in the under-17 grade and then this year he claimed four golds, two silvers and a bronze at under-19 level in just his third national championships. Coached by Christchurch's Hamish Ferguson, Kennett attends Waitaki Boys' High School in Oamaru, leaving home at 7am each day and not getting home until about 5pm. That makes it difficult to get quality road training in, especially during the winter, meaning much of his preparation happens on the indoor trainer. "It's hard to keep your motivation up on the trainer, which is probably why I go better on the track than on the road," Kennett said. It was the turn of the national sprint squad to show their wares last night after the New Zealand endurance riders had been in action during the first two nights. The end of the three-day track carnival at the ILT Velodrome last night meant a goodbye to the 40-strong Australian junior contingent, which has raced the Yunca-sponsored Junior Tour of Southland and the track during the past 10 days. New South Wales coach Kurt Polock, who brought 26 riders across the Tasman, estimated the annual trip to Invercargill cost up to $60,000. While a portion of that went into flights, a lot also went directly into the local economy, Polock said.